Santa Fe is a place of unparalleled history. Descending from two distinct cultures, the present-day city takes tremendous pride in honoring the traditions of both the Native Americans and the Hispanic peoples. When the paths of two cultures cross as they do in Santa Fe, the result becomes a beautiful blend of festive, fun and meaningful celebrations. The story begins with the Native American people. Adding splashes of vibrant color to the land of Northern New Mexico, Pueblo Indian dances and feast days take place throughout the winter season and have become a cherished event to attend, a window into Santa Fe’s deepest roots. Hispanic celebrations include Los Posadas, a traditional Spanish outdoor play which all join in. The many luminaras and farolitos that light up Santa Fe in the darkness of winter are another touch of the Spanish culture. On Christmas Eve, tradition continues with the Farolito Walk on Canyon Road, an event to light the hearts and souls of the many who take part. To the past and present people of Santa Fe, the outdoors also holds special meaning. Even in the heart of the city, you can hear nature calling. From skiing the infamous New Mexican mountains to hiking through snow-draped woods, it is easy to experience the glorious solitude of winter. 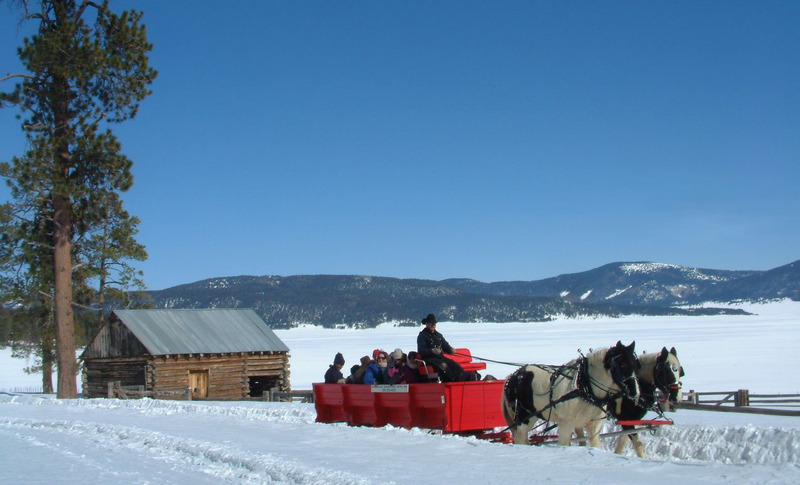 For a fairytale twist, head to the Valles Caldera National Preserve for a gentle horse-drawn wagon or sleigh ride. Breathe in the crisp air and observe the peaceful wildlife while traveling slowly through the beautiful landscape. There is a magic in the air of Santa Fe during the winter months, a lingering warmth calling people to come together, celebrate and partake in these wonderful events. We invite you to unpack your bags, join in these traditions and make them your own. No matter where you are in Santa Fe, the atmosphere is festive and pure, and Adobe Destinations will find the perfect Santa Fe vacation rental for your visit! This entry was posted in Uncategorized and tagged Canyon Road, farolitos, Hispanic Tradition, Los Posadas, Native American Tradition, New Mexico, New Mexico Vacation, Santa Fe, Santa Fe Plaza, Santa Fe Vacation, Ski Rental, Ski Vacation, Southwest Vacation, Spanish Tradition, Valles Caldera National Preserve. Bookmark the permalink.